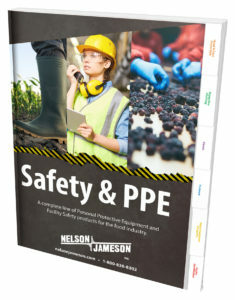 We are pleased to announce the arrival of our newest catalog – the Nelson-Jameson Safety & PPE Catalog. This 256 page catalog features a complete line of personal protective equipment and facility safety products to keep employees safe in the food industry. Filled with products and useful information to help customers stay compliant as well as understand the different safety standards that are out there – our Safety & PPE Catalog truly is, a purchasing resource. Special features, like a user-friendly layout, step indexing tabs to easily find sections, and material guides to assist in choosing the correct product for your application, help provide customers with a one-stop source for keeping employees and product safe. To request your free copy call 800-826-8302 or visit nelsonjameson.com. Or view the interactive PDF version of our Safety & PPE Catalog now!